You can tell it has been dry here when the girls are amazed by rain. Last Saturday while driving home we hit a storm, and the girls were just in awe of all the rain! Touched off by that rainstorm, I decided we would try some hands-on storm experiments. We actually ended up doing 3 because they were all fairly short and easy to do, and they were all done in mason jars! 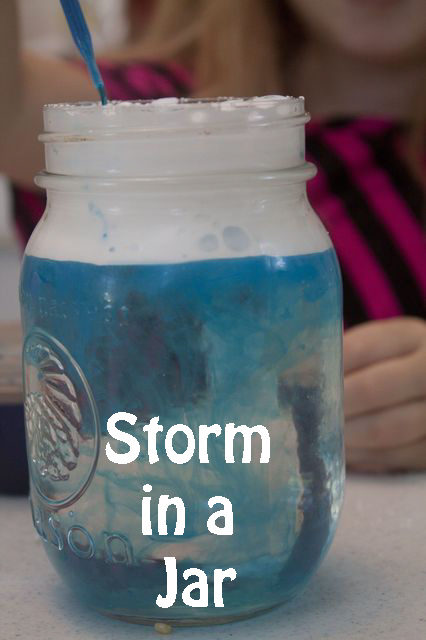 The first one (Storm in a Jar) we did was to make a "cloud" of shaving cream rain into a jar. You need a jar filled with water, shaving cream, colored water, and eye droppers. Make your cloud on top of your water with the shaving cream. Our shaving cream was about empty, so ours was a bit more watery then I would have liked. Using the eye dropper put squirts of colored water on top of your cloud. Once the cloud is saturated enough the color will begin to "rain" into the jar. It didn't take long for us since we had watery shaving cream. Continue making it rain and add colors! The girls had a terrible looking storm going! Actually by the end of it they had dark gray water and an overflowing jar! 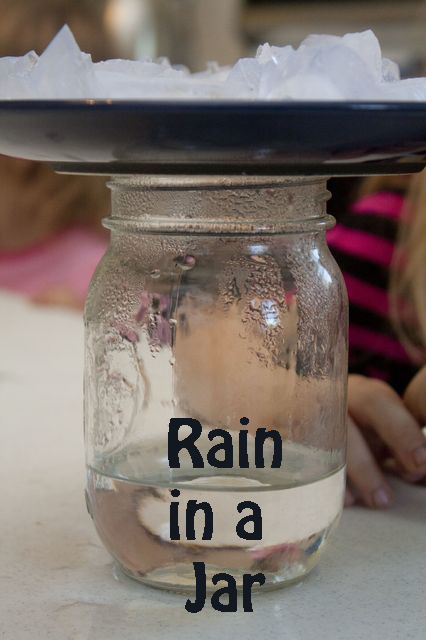 The second experiment (Rain in a Jar) we did was to actually make it rain through condensation. All you need for this is hot water, a jar, a plate, and some ice. Pour a couple inches of hot water in the jar and cover with the plate. Let sit. After a couple minutes place ice on the plate. The steam trapped in the air in the jar will condensate on the plate and roll down the sides of the jar. Similar to how rain comes down when hot and cold air mix. To be honest, the girls were not impressed by this. Too slow for their liking; maybe when they get older we will try again. 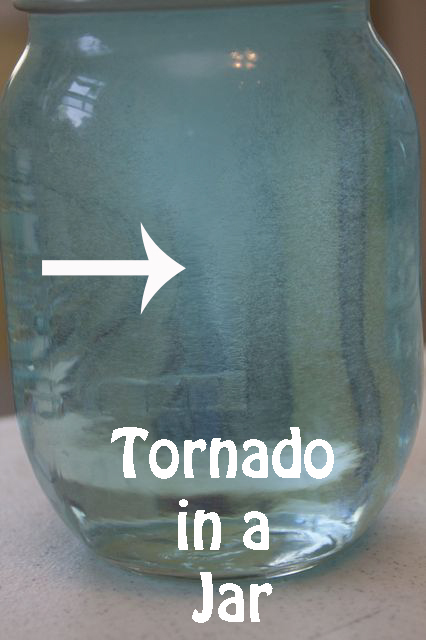 Just for fun while we were letting our hot water sit we tried a third experiment (Tornado in a Jar). All you need for this is a jar with a lid, water, and dish soap. Fill your jar with water, add a squirt of dish soap, and screw on the lid. Then you just have to swirl or shake the jar. Look for a little tornado inside. I added more soap to try and get more obvious tornado, but the extra soap didn't really make it any more obvious. The white part in the center is the tornado. I also found an awesome site with lots of weather experiments (this is where the rain in a jar came from): Weather Wiz Kids. More recently we have also explored thunderstorms and made our own cloud!